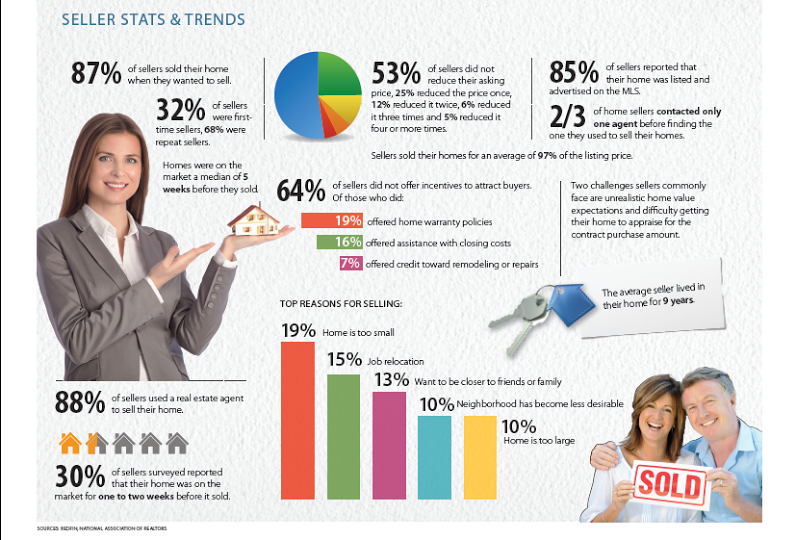 I just found another real estate infographic produced by the National Association of REALTORS, and it shows that people continue to make the same old mistakes when they decide to sell their home. But it also provides information about events that occurred during the home selling process, and I think anybody who is planning on putting their home on the market can learn (from the mistakes of others) with a quick study of this image. The following infographic is floating around the internet and claims to be produced by the NAR. Before we review the top reasons why sellers chose to sell their home, it is important to note that this information comes from a survey of people who sold their home, it does not include all those people who listed their home for sale and failed to sell their home. So we are studying the results of a survey of SUCCESSFUL HOME SELLERS, and know that we would some serious differences if we survey those that failed to get their home sold while it was on the market. If you are thinking about moving, you should examine your reason for doing so. In my 23 years selling homes in Tallahassee, I have found that seller motivation is the top determinant whether or not a home gets sold. In the good markets as well as the bad markets, highly motivated home sellers are usually successful. According to the survey, 2/3rds of home sellers only contacted 1 real estate agent before finding the one they used to sell their home. This just blows me away (maybe). If they used the internet to do their homework, found the top local online real estate marketing agent, and then interviewed that agent first, then I understand it. But I doubt that was often the case. I find it remarkable that people do not do more diligent study before agreeing to pay somebody tens of thousands of dollars for a competitive service. Is it likely that all agents are strong marketers? After all, you want as many buyers to see your home as possible, right? And are all agents strong negotiators? Certainly you'd like to get top dollar for your home, right? According to this survey, the average home seller lived in their home for 9 years. This current duration is a few years longer than I saw in a survey several years ago, and I suspect the housing bubble has impacted this statistic quite a bit. We should it expect to see it grow even further in the coming years. If you are thinking about making a move, simply drop me a note and we can get our team of home selling experts together with you to explore all of your options and opportunities, you'll be glad you did.